^ Day, John (2009). "Beetle bioluminescence: a genetic and enzymatic research review". In Meyer-Rochow, V.B. Bioluminescence in Focus. Research Signpost: Kerala. pp. 325–355. ^ Sala, Osvaldo E.; Chapin, F. Stuart; Iii; Armesto, Juan J.; Berlow, Eric; Bloomfield, Janine; Dirzo, Rodolfo; Huber-Sanwald, Elisabeth; Huenneke, Laura F. (2000-03-10). "Global Biodiversity Scenarios for the Year 2100". Science. 287 (5459): 1770–1774. doi:10.1126/science.287.5459.1770. ISSN 0036-8075. PMID 10710299. ^ Firebaugh, Ariel; Haynes, Kyle J. (2016-12-01). "Experimental tests of light-pollution impacts on nocturnal insect courtship and dispersal". Oecologia. 182 (4): 1203–1211. doi:10.1007/s00442-016-3723-1. ISSN 0029-8549. PMID 27646716. ^ Owens, Avalon Celeste Stevahn; Meyer-Rochow, Victor Benno; Yang, En-Cheng (2018-02-07). 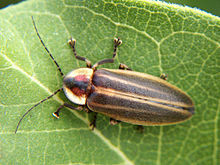 "Short- and mid-wavelength artificial light influences the flash signals of Aquatica ficta fireflies (Coleoptera: Lampyridae)". PLOS One. 13 (2): e0191576. doi:10.1371/journal.pone.0191576. ISSN 1932-6203. PMC 5802884. PMID 29415023.